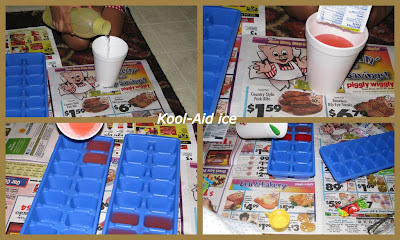 We made Kool-aid ice cubes and used them for stamping, painting. Last week CJ and I had fun kneading Kool-aid to white homemade play-dough. We used Kitchen tissue paper for the stamping. Adding a Popsicle stick/Craft stick to the ice cubes would have made it easier to grip/hold. Place the ice cubes in a pattern as you wish. When the color bleeds to paper. Remove the ice cubes. Set aside to dry and when dry you have a different, beautiful painting! Just set the ice cubes on the paper and keep them moving. Filling the white spaces with ice paint as you move. Lay a kitchen tissue roll sheet on the slide as shown and place the ice cubes on top of the slide. Let them melt and keeping moving. When you reach the sliding area let the ice melt. After 10 mins of melting, we got this beautiful kool-aid dyed kitchen tissue. I love the sliding effect. This activity is messy but lots fun and Perfect for hot summer day. Note: Kool-aid liquid will stain so safe-guard your clothes and the work area. Love it!! The colors look so vibrant too, i really need to buy some kool aid now:) We did slide painting with icecubes last weekend but outside. I am very glad to read your blog because it is very useful for everyone who have the need of Cube Display type of products, much more. I would like to inform you that a user can get maximum information and learn many things this is one of the informative blog which I have read. Aaah lots and lots of fun had here! And how great to watch the ice cubes melt and the colours spread! Thanks for joining Kids Get Crafty! It looks- yummy! Thanks for sharing another great idea! Thank you so much for sharing lots of ideas witht he Carnival of Outdoor Play. I love this idea especially for a sunny day. I's be great to let the sun melt the ice and create it's own art.